Find everything you need for a great party in Rotorua. We can help you plan and book your party or a weekend get away. Call GoBananas today for easy and hassle-free party planning. 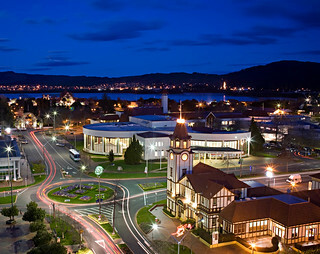 Rotorua is situated in the scenic eastern Bay of Plenty and is one of New Zealand’s premiere tourism destinations. It’s an exciting hub for anyone wanting to experience Maori culture through food, dance and art. Not only that, it’s central as a water sports playground as the city is built on the shores of Lake Rotorua. Lake Tarawera, Lake Rotoma and Lake Rotoiti are also just a short drive away. Mud is a big thing here with thousands flocking here each year to see the amazing geysers and natural pools. The things to do in Rotorua are numerous and you’ll be hard pressed to find a better party destination. Rotorua has an airport that also services some international Australian flights. Otherwise, it’s an easy drive down from Auckland which takes approximately three hours. Hiring a car is the best way to get around, particularly if you want to investigate the many lakes in the region. Alternatively, there are many tourism operators who arrange tours so if you don’t want to travel independently it won’t be a problem. 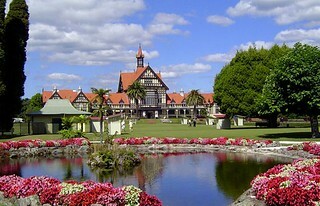 Rotorua is great all year round. The summers are fantastic of course due to the water sport activities on offer, but because Rotorua is made to welcome guests all year round, there is always a lot to do in any kind of weather. Just a word of warning, Rotorua can be quite chilly in winter so rug up well because you won’t want to hide inside while at this beautiful destination. This iconic paddle steamer is a great way to see the lake as you cruise about and enjoy a beautiful buffet dinner with million dollar views. This boat operates all year round and is well worth it, even in wintry weather. This is a wonderful birthday party idea if you want to treat your guests to something special. This experience is not to be missed. Whether for just an evening or an overnight stay, you’ll be brought into another world and shown life in Aotearoa before the Europeans arrived. A traditional hangi feast is just one of the experiences that you’ll be shown along with cultural performances. This is a premier activity in Rotorua for locals and international visitors alike and a must for anyone searching for things to see and do in Rotorua. It’s not as scary as it sounds. This geothermal mud baths and hot pools will rejuvenate and relax you. It’s a must do. Haven’t you heard of the magical Rotorua mud? This is a great Rotorua activity to get a group together and have fun. It doesn’t get much purer than these refreshing springs. A short and scenic walk leads to the North Island’s deepest natural freshwater spring. This is a chance to experience nature at its finest with native birds serenading walkers as they pass by the redwoods and breathe in the fresh air. This is a lovely idea for a way to start off a birthday party weekend. Combine a must do activity with this wonderful buffet restaurant. Take the gondala up to the top of the mountain and be wined in dined in style as you enjoy views of the lake and the city. Situated on Eruera Street, this award winning restaurant gives a French fine dining experience in the heart of Rotorua. Make sure you book ahead as tables are in high demand. This is the perfect place for your birthday dinner so keep it in mind when searching for ideas for your birthday party. You’ll find this iconic pub on the corner of Haupapa and Tutanekai Streets. With an outdoor garden bar and live music several nights a week, this is a Rotorua staple. The private function rooms make it a great idea for a party in Rotorua.